Do you long for more passion in your life? How do you define passion? Many people associate passion with intense romance, adventure, creativity, vocation, or calling. If you ask a pastor or priest to define passion, he or she would likely link the word to the passion of Christ, to the events of Holy Week. The definition of passion has evolved over the years. Originally the word came from the Latin passio, which means "to suffer." The passionate life isn't easy, Kadlecek says. Suffering can come when we pursue our passions. We have to take risks; we must jump overboard. 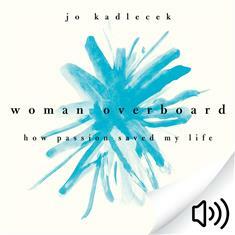 We need to recognize that jumping overboard could be hard, scary, and dangerous. But consider how dangerous it would be to just stay where you are. When we anchor our identity in the passion of Christ, we are free to jump overboard. We are free to take the risks we've always wanted to take, to pursue the things we've always wanted to pursue. So what are you waiting for? Dive into the journey of waking up to the passion and gifts around you!